The BS83xxxC series of devices are Holtek's newly released Touch Key Flash MCUs. In addition to including all the advantages of the BS83BxxA touch key Flash MCUs, this new series has better noise immunity, allowing them to resist various types of noise interference such as power noise, RF interference, power fluctuations, etc. 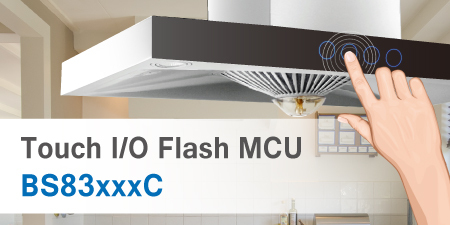 They can be used in product applications such as smoke exhaust ventilators, induction cookers, microwave ovens, pricing scales, to name but a few. The new BS83BxxxC family includes four devices which are the BS83B04C, BS83B08C, BS83B12C, and BS83B16C. These devices contain 4, 8, 12 and 16 touch keys, respectively. The BS83B04C is an ultra-low power consumption touch key MCU, which supports 4 touch keys and includes touch key hardware automatic scanning and judgement functions. During touch key detection the device functions with a very low operating current. Take the operating voltage of 3V for example, the four touch key detection function can be implemented with an average operating current of less than 2μA. In addition, the BS83B04C operates with a low power supply operating voltage of 1.8V~5.5V and includes a 5-level optional LVR trigger voltage range of 1.7V~3.8V as well as having an integrated I2C interface. The device is pin-compatible with the BS83B04A. The BS83B04C is available in 8-pin SOP and 10-pin DFN package types. The small packaging and low power consumption make this device especially suitable for use in portable product applications. The BS83B08C, BS83B12C and BS83B16C contain 8, 12 and 16 touch keys respectively, and have an operating voltage of 2.2V ~ 5.5V and a 4-level optional LVR trigger voltage range of 2.1V~3.8V as well as having integrated SPI and I2C interfaces. The BS83B08C, BS83B12C and BS83B16C are pin-compatible with the BS83B08A, BS83B12A and BS83B16A respectively. The BS83B08C is available in 16-pin NSOP and 16-pin SSOP package types, the BS83B12C is available in 20-pin SOP and 20-pinSSOP package types and the BS83B16C is available in 24-pin SOP and 24-pin SSOP package types. The BS83xxxC series devices can be used as master MCUs for the complete applications or work together with other master MCUs to implement touch key detection. Holtek also fully supports these devices with a comprehensive suite of hardware and software development tools. The software includes a touch key function library which enables designers to develop their products more rapidly. The hardware development tool is known as the e-Link which works together with an OCDS evaluation MCU to provide users with an actual MCU device with which development emulation and debug can be implemented.